Carry Your Meds in Style! Announcement MEDICATIONS ON THE IMAGES ARE NOT INCLUDED. Images of epinephrine auto-injectors, diabetes supplies and other medications intended to show the size of the bag and possible configurations. MEDICATIONS ON THE IMAGES ARE NOT INCLUDED. 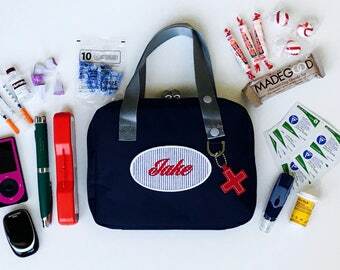 Images of epinephrine auto-injectors, diabetes supplies and other medications intended to show the size of the bag and possible configurations. Perfect for keeping IV supplies organized on the go when we don't want to carry a full bag. Perfect to store IV flushes and extra batteries for my son's central IV line and pump! Perfect for my son's TPN backpack! Monograms are great for teens! PINK & GRAY bags have adjustable straps. PINK & GRAY gives back! Give the gift of PINK & GRAY! 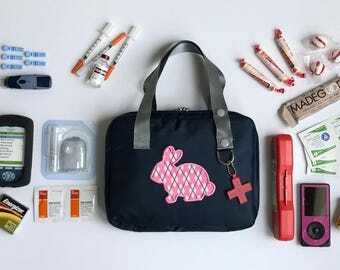 PINK & GRAY - Carry your meds in style! PINK & GRAY's #1 goal is to empower kids who carry life-saving medications!